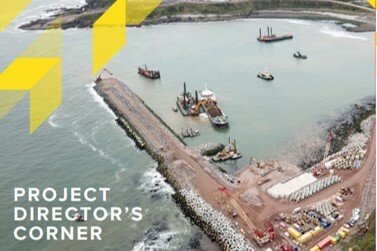 Construction has now commenced on Aberdeen Harbour Board's £350 million development of additional facilities in Nigg Bay, to the south of the existing harbour. This follows six years of unprecedented public engagement by the Board and Executive Team across the widest range of stakeholders. Once completed this will be called Aberdeen South Harbour. Caisson Construction Marks New Phase for Construction Project. The footprint of the 400 metre-long Dunnottar Quay became all the more apparent this weekend with the arrival of a third concrete caisson from Invergordon. As per tradition the caisson is named after the loved one of one of those most closely involved with the project. In this case the caisson is named after Louise Parker, wife of the organisation's previous Chief Executive, Colin Parker. Eventually, twenty-two caissons will be towed into South Harbour to form the closed quay sections. The caissons are 50 meters long, 15 meters wide and 16 meters deep, and have been made in La Coruna, in North-west Spain. Construction Project milestone achieved as Dredging work commences. The £350 million expansion of Aberdeen Harbour will open significant opportunities for the city as well as the wider economy, from up-scaled decommissioning activity and being able to accommodate larger commercial vessels, to an increased share of the available cruise vessel fleet. This new video highlights features of the new state-of-the-art facilities, which are due to be completed in 2020. Dragados provide a summary of the key South Harbour Construction Milestones.